The club's RYA approved Powerboating School runs courses for both non-members and any club members wishing to improve their skills. 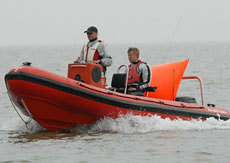 Handling a powerboat is an incredible feeling and can be very useful. 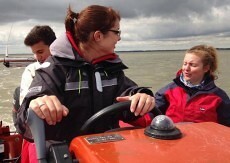 Appropriate training ensures that powerboat drivers, their passengers and other water users feel confident and safe. 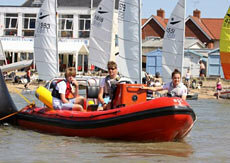 Brightlingsea Powerboating School offers excellent training in river and sea-based conditions. This two day course is at the core of our training provision and is designed for both absolute beginners and existing boat users. The RYA Powerboat 2 qualification is recognised in many countries and is the required standard to allow certificate holders to hire powerboats up to 10m (International Certificate of Competence). The course is designed so students spend more than 70% of their time afloat. In this course, the emphasis is very much on safe boat handling in harbours and out to sea. Time is spent learning the art of mooring, turning in confined spaces, recovering a man overboard and, of course, how to get a boat going fast on the plane and keeping it there comfortably. We also try to include practical section on navigation at sea. If you are a club member and feel you could profit from some tuition on how to helm and crew a rescue boat, please get in touch as we are able to provide free sessions in this regard from time to time. For further details about all elements of powerboat training please contact Craig Bond on learnsailing@sailbrightlingsea.com or 07894 507812.